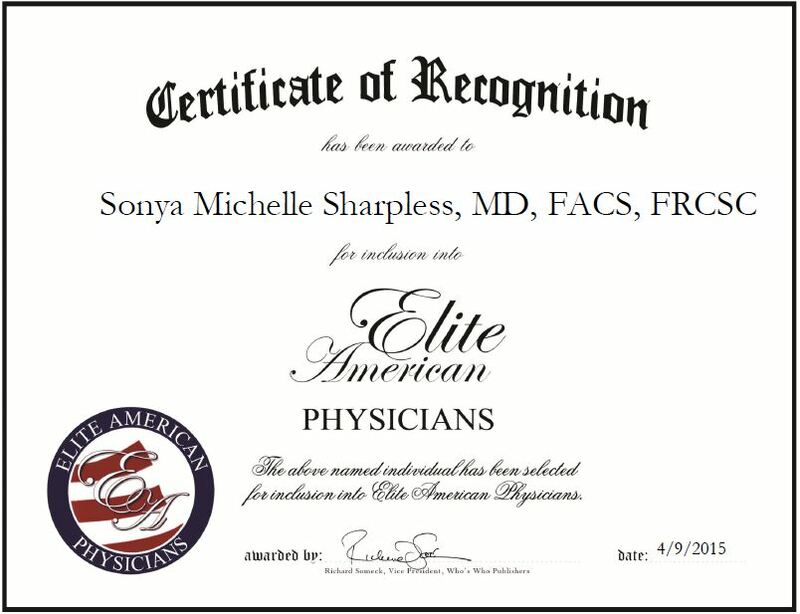 Highland Park, IL, April 9, 2015, Sonya Michelle Sharpless, MD, FACS, FRCSC, Surgical Oncologist at North Shore Advanced Surgery, has been recognized by Elite American Physicians for dedication, achievement and leadership in cancer treatments. Dr. Sharpless always wanted to be a doctor. She got into medicine and decided to pursue surgery, specifically in oncology because cancer is different in every patient and that makes the work challenging and interesting. Dr. Sharpless has been practicing medicine for 20 years and has extensive experience working with patients suffering from sarcoma, melanoma, breast cancer and thyroid cancer. As a surgical oncologist, she brings her special expertise in cancer to surrounding community hospitals, as well as gives community outreach talks to educate the public on cancer. Dr. Sharpless also sees newly diagnosed patients and organizes them for surgery or radiation, and works as part of a team to get them treated. Dr. Sharpless takes great pride in her work and in her ability to educate her patients and fellow colleagues. For her efforts, she was honored with the Instructors Award by the American Cancer Society. She attributes her success to word of mouth through patients. She has never had to advertise. Once you have 100 patients who like you, it’s automatic. In the coming years, Dr. Sharpless aims to remain a private physician and offer personalized care that is not dictated by a corporation. This entry was posted in Oncology and tagged breast cancer, melanoma, radiation, sarcoma, surgeon, surgery, thyroid cancer. Bookmark the permalink.